• The contest is open to all residents of Newfoundland & Labrador who are 18 years of age or older. • Stories (fiction, non-fiction, or creative non-fiction) must be in English. • No profanity should be used. • Stories must be unpublished (in print or online) and not currently submitted to any other contest or publication. • Entries must be typed, double-spaced in 12 pt font. • Only one submission per participant. • Blind judging: do not indicate your name on the story itself. Instead, provide the following information in a separate document, or in the body of an e-mail: author’s name, mailing address, e-mail address, phone number, story title, and word count. • WANL, NQ, The Travel Bug, and Broken Books staff, contract employees, and board members are not eligible. 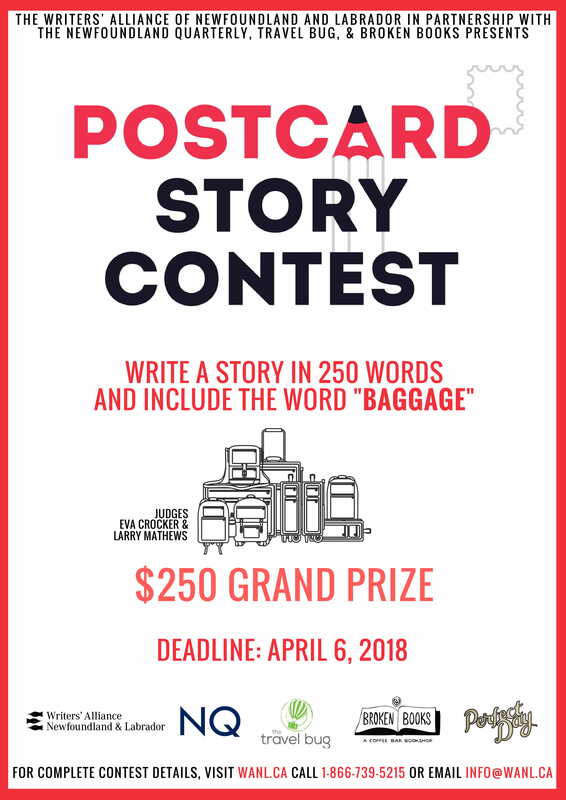 • Use the subject line “Postcard Story Contest”. • Provide contact information and title of story in the body of the e-mail. • Attach story as a PDF document. The 2018 Postcard Story Contest is presented by the Writers’ Alliance of Newfoundland & Labrador in partnership with Newfoundland Quarterly, The Travel Bug, and Broken Books. Postcard Story Contest logo designed by Perfect Day. 2018 Judges are Eva Crocker and Larry Mathews. NQ takes first serial rights of winning entries only for print. All other rights remain with the author. Many thanks also to our awards and contest supporters. Content © 2019 WANL. Designed by Matthew Hollett.